We have another guest host for episode 37. This time it’s Bret Kramer joining us to talk about his new e-Zine, The Arkham Gazette! 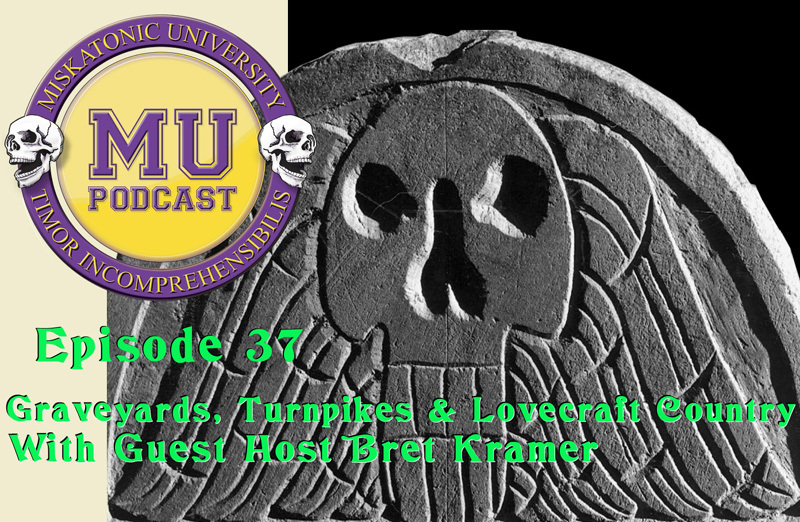 We also talk about graveyards, turnpikes, and general Lovecraft Country coolness. “The Doom That Came To Atlantic City!” Fails after successful Kickstarter. Cryptozoic is going to publish this game, so the Kickstarter backers will not lose their investment! World War Cthulhu: The Darkest Hour is available for pre-order from Cubicle 7. Mike Mason talks about the CoC 7e card decks on his Angry Zoog blog. We have the Sleepless City contest results! So, we’ve got our list of contestants for the Tales of the Sleepless City contest. This time we ran some kind of non-Euclidian social media algorithm, and ended up with our winner, Justine A! Congratulations Justine. We’ll be getting in touch with you, and soon you’ll have a copy of this fine tome in your hands. The gaming schedule for NecronomiCon has been released! Our Card Catalog for this episode is submitted by our guest co-host Bret. He has several links to some great galleries of historic graveyards of New England. Here is the Google Map of all the cemeteries that Bret has visited. We didn’t really end up with a definitive side topic. We intended to have a talk about the Arkham Gazette as the side, then Lovecraft Country as the main, but it all just blended together into one main discussion. While the conversation wanders all over the place, we all had a lot of fun. Here are the links we could find that were mentioned in the episode. The blog of Jason Colavito. This the angry “skeptical xenoarchaeologist” Bret mentions in the interview. Unreleased Call of Cthulhu supplements on the Yog-Sothoth Wiki. Professor Edmund Delabarre of Brown University wrote the first book on Petroglyphs in 192. He’d make a great NPC resource for investigators. His book Recent history of Dighton rock (1919) is available on Archive.org. Mi’kmaq hieroglyphs, also known as “Sucker Fish Writing”. The Official maps of New England (1921) Free on Archive.org. The Monograph Bret wrote involving the Soviet military is Machine Tractor Station Kharkov-37. Masks of Nyarlathotep Companion free download.